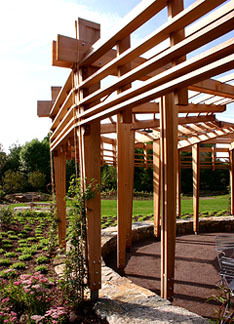 This contemporary pergola creates a wonderful focal point and meeting place in a suburban complex of townhouses. The open-style structure will soon be covered with vines producing significant shade at the height of the summer season. Stainless steel rods and acorn screw caps were used to assemble the structure, resulting in very clean design accents. An interesting design for the base bracket using ½" stainless steel, was incorporated to create stability in this very tall 12' structure. 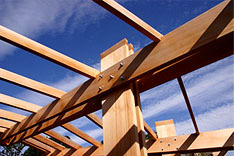 The heavy lattice type frame that divides the tapered post assemblies also aides in the overall structural stability. 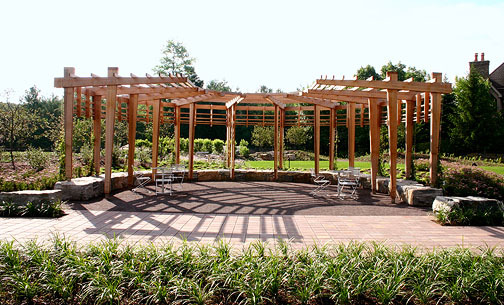 This very attractive and challenging project was designed in conjunction with Cave Hill Landscape Architects. 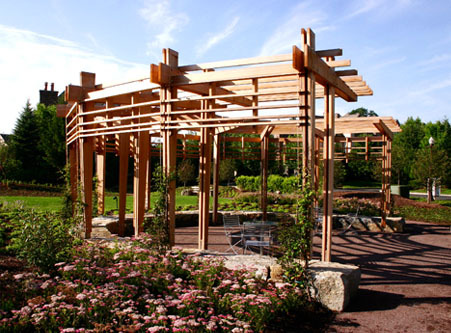 Trellis Structures provided engineering, fabrication and installation.